Live text of Molde v Celtic. And that's the end of another European week for teams in the Premier League. We shall see you all at the weekend. Until then, good night! Have you reserved the sofa/trip to the pub on Sunday? Some excellent Premier League drama to choose from as Newcastle face Sunderland, Manchester United take on City and Liverpool take on Southampton. And why not take part in our predictor game and see how you get on? The French side lost 3-2 in Braga tonight. Despite their horrible European form, they are third in the group, a point behind second-placed Slovan Liberec. So where do we go from here? Celtic are in trouble, bottom of their group on two points, two behind Fenerbahce in second but five adrift of Molde, their conquerors tonight. Liverpool have drawn all three games in the competition now and are second in their group. FC Sion are four clear at the top while the Reds have a one-point cushion on Rubin Kazan and Bordeaux. The next match day on 5 November sees tonight's fixtures reversed. "Two things we've learned. Klopp knows he's got an average squad & Liverpool's fans have to understand there are no miracles in football." Jurgen Klopp is in a calm mood in front of the TV cameras. He says that Rubin Kazan's goal was brilliant and that his team are not full of confidence. Former Liverpool winger Steve McManaman is very, very, very unhappy with that on BT Sport. "Liverpool should be dismantling Rubin Kazan," he says. "This is a poor team down to 10 men..."
"One of the least inspiring performances from Celtic in Europe in recent times. Aside from a decent opening spell, they were second-best throughout. Molde look a pretty good team but for Celtic to be outplayed by a team sitting seventh in the Norwegian league is a million miles from the type of performance being turned in by the club only three seasons ago in the Champions League." What will Mr. Klopp have to say about that then? Not how he would have hoped his Anfield debut to go and it's two draws to start his era. Right now there is no absolutely no chemistry in this team, looks like a bunch of strangers who don't know what to do with each other. Follow the fallout from that one here. Jurgen Klopp trudges onto the Anfield pitch and shakes the hands of his team and the opponents. James Milner looks at him sheepishly. They both know that that is a frustrating evening against 10 men for an hour or so. And perhaps unsurprisingly, Besiktas fans have cracked open the flares. They love a flare. Even a 1-1 draw at Lokomotiv Moscow is reason enough for some. Nice neat play down the right, Adam Lallana's cross is nodded out to Lucas - wide! TWO minutes left. That wave of optimism and momentum may have hit the wall. Liverpool have had 29 attempts on goal but only six have been on target, and goalkeeper Sergei Ryzhikov hasn't looked in too much danger. Four minutes left now. All Liverpool - but then Kazan win a corner and it's headed wide! NOW we are talking, NOW the Kop is in full voice. Liverpool force their 13th corner and the increase in energy and drive is mirrored by the increase in volume. Anfield sounds great now. Comical decision to bring Kris Commons off with 20 mins to go. Let's not paper over the cracks. Defensively Celtic over the place. Adam Lallana now thumps a shot which is well saved by Sergei Ryzhikov. Liverpool ending the game really well but we are into the last eight minutes. A great counter attack! Adam Lallana is at the heart of it, swerving away from a defender cleverly on halfway and then taking it downtown. Christian Benteke peels away into space on the left of the area, the ball is slid into him perfectly, he goes for the first-time hit and bends it against the base of the post. Lovely effort - no cigar! He yells and shouts and yells and shouts some more - all in the direction of the managerial staff. John Collins looks far from impressed. Coulda, shoulda, woulda - almost through for Christian Benteke but his touch is understandably that of a man who has had a month off, not great. We are seeing some solid hugging around Europe right now. Roberto Soldado has netted so Villarreal now lead Dinamo Minsk 4-0. Pictured right, Rapid Vienna celebrate - they lead Viktoria Plzen 3-1 in the same group and look like moving onto nine points, three ahead of Villarreal. Sion still lead in Bordeaux, so Liverpool's result would see the Reds move second in the group, four points behind the Swiss side. In Group A, Fenerbahce and Ajax is goalless so Celtic will be bottom of the table but just a point off second place. An Ajax winner is NOT what Celtic need. One final change, 16 minutes on the clock as Roberto Firmino is on for Divock Origi. Jurgen Klopp should know all about the ex-Hoffenheim man, who hasn't done much for Liverpool yet. Emre Can then hits another shot on goal. There's the cross of the night, right there. Nathaniel Clyne was at fault for Kazan's goal but that was sensational, bent in at pace, didn't try and beat his man, just dug it in there early. It comes to Christian Benteke, unmarked, and he volleys into the Kop. An awkward height? Should do better? Into the last 20 minutes - and you'd be forgiven for forgetting that Liverpool have had an extra man for the entire second half. Yes, Kazan's horizons have been limited, yes they have camped in behind and yes it is difficult to break sides down, but yes, Liverpool have not offered a great deal in attack. Christian Benteke! Great cross from Alberto Moreno, the number nine attacks it and you have to say that is wonderful defending to get something on the header and turn it over. Jurgen Klopp is flapping his hands, urging his side on. They have 22 minutes to find a way through. That change seems to have brought a change in impetus again as Liverpool kick it up a gear. Christian Benteke's first touch sees him control a ball on his chest and get a shot away before Magomed Ozdoev hooks a clearance just over his own crossbar. "An utterly crazy 60 seconds, which began with the Celtic fans in raptures at Kris Commons' goal and ended with them tearing their hair out as Mohamed Elyounoussi squeezed the ball past Craig Gordon to restore the two-goal lead. Ronny Deila will surely be equally frustrated by the failure to capitalise on the chink of light offered by the Commons goal." The good news for Liverpool fans is that £32m man Christian Benteke is back, the (maybe) bad news is that he replaces Philippe Coutinho. The number 10 has not been at his best. Two up front for Liverpool now, 27 minutes left. Again, that is almost brilliant from Philippe Coutinho! James Milner into the penalty area like a bull in a china shop, charging in and over-running the ball. It falls to Coutinho, who sells a dummy to three defenders with a brilliant drop of the shoulder. It opens up for him to shoot - but he drifts an effort wide. Tame. An audible frustration maybe just setting in at Anfield, but the Kop does roar on Mamadou Sakho as the centre-half runs with the ball, taking on a few men and then winning a free-kick. Philippe Coutinho takes it on and fires wide from 22 yards. Here comes Christian Benteke. Half an hour left. However, no sooner had Celtic got a goal, Molde restore their two-goal cushion as Mohamed Elyounoussi volleys in at the far post from a cross. Follow the action from that game here. A lifeline? Kris Commons pounces on a shocking backpass to take the ball past the last man and lift into the roof of the net. Very silky finish. Liverpool totally dominant now. Nathaniel Clyne gets around the back but he can't find a red shirt. Not much action of note in the opening stages in Norway - where the weather continues to look horrendous. Slow, ponderous, patient. Liverpool's build-up play is all a bit too safe. A bit too predictable. Maybe that's what you need against an opponent who has dug the trenches, but you get the feeling it's not what Anfield came for tonight. It's very quiet again inside the old stadium. Jurgen Klopp sends out Kolo Toure, Roberto Firmino and Christian Benteke out to warm-up on the sidelines. Changes may be afoot. Kazan look happy to camp their nine men behind the ball now. Liverpool instantly win a corner and Divock Origi heads down, into the turf and then wide. He's an all-action player, Origi. I'm not convinced he often knows what he's going to do but he is well worth watching. Seconds later Emre Can has a shot blocked. There is a change at the break - but it's not one I saw coming. Lucas is on in place of Joe Allen. And we are back under way. Will Jurgen Klopp make a change or two at the break? A reminder if you are tuning in that he has Christian Benteke and Roberto Firmino on the bench tonight. Jurgen, three things..... 1, We're too narrow 2, we're too narrow 3, we're too narrow. Just saying!! It's a shame we can't hear what Jurgen Klopp is saying at half-time. Press, press, press? "Celtic giving the ball away too cheaply and too often. Izaguirre and Brown in particular are the guilty parties at the moment. Molde look as comfortable as a team can look in a howling gale and a monsoon!" Jurgen Klopp ends the half as he began it, jogging off at pace and clapping his hands. One all, but Liverpool have the extra man. The Klopp hysteria aside, Liverpool could really do with capitalising on this Sion lead in Bordeaux and will move onto seven points with a win. The Reds can reach five if they come out on top. Elsewhere, Cedric Bakumbu has a double for Villarreal as they lead 2-0 against Dinamo Minsk while Napoli are heading for nine points from nine - 3-0 up against FC Midtjylland. Manolo Gabbiadini has two for the Italian side. Any relation to a Derby County legend? Jurgen likes this one, a thumbs up and a vigorous nod of the head to meet Philippe Coutinho's low shot wide from the fringe of the area. It all came from a good lay-off by Divock Origi. A spring in the step of the men in red now as they look for a swift second. Alberto Moreno hoovers up the yards down the left wing but his cross is poor and Joe Allen is booked for a late challenge in midfield. Will Jurgen Klopp add an extra attacker against the 10 men at half-time? We'll see how positive he is. If you can't be good, be lucky. Liverpool ruthlessly exploit the extra man as they equalise before Oleg Kuzmin was back down the tunnel. Philippe Coutinho's cross is headed down by Divock Origi and Emre Can is unmarked to fire in at the Anfield Road end from three yards out. Well that is a brainless decision from Rubin Kazan captain Oleg Kuzmin, and it may just have handed Jurgen Klopp's side a way back into the game. Emre Can runs at the right-back, already on a booking, and he steps across him. Clear booking, poor decision. Big moment? Big problems for Liverpool, Jurgen get your notebook out! Liverpool have been the better side for the last 10 minutes but they look very fragile at the back. Again it's one good pass forwards, Emre Can does not track Blagov Georgiev and his shot on goal is well turned away by Simon Mignolet. Could the plastic pitch flood? "This is turning horribly wrong for Celtic, whose best hope at this stage might be the abandonment of the match in worsening conditions. They started so well but defensive slackness has cost them. They have to recover their poise, which will be easier said than done in the face of driving wind and rain." Philippe Coutinho gets the ball to feet, drags it back and then tries to chip the keeper but hits it straight at Sergei Ryzhikov. Thirty seconds later Adam Lallana does exactly the same thing. Exactly! So Jurgen Klopp has shown us he does not intend on replicating Saturday's showing and being a tracksuit manager during his time in England. Tonight he's gone for a long coat, it's pretty suave. Beware though Jurgen, the coat choice has been known follow a manager. We'd say you're coming out ahead of average here. Perhaps not quite James Dean but far from a disaster. Remember the basics - stay away from anything which resembles a sleeping bag. Jurgen Klopp is fast finding out more and more about this Liverpool team, and he may not like all that he sees. Anfield has gone rather flat, it needs a goal or at least a good chance to lift it again. Will we find out under Jurgen Klopp just what Emre Can is all about? He is playing through the centre of midfield tonight and does well to beat one man before running into a cul-de-sac. Liverpool playing at a high tempo. That was almost brilliant from Philippe Coutinho. Almost being the key word, admittedly, but he first anticipated a loose pass across the back four, then cut it out and drove on at the back four. He beats one man with a Chrissy Waddle body swerve and then fires wide on his left foot. Better! Almost a quick response from Liverpool as they win a free-kick on the left side of the Rubin Kazan area. Philippe Coutinho whips it in fast and low and Adam Lallana gets down to direct a header just over the bar. Moments later, Divock Origi flicks a shot just wide from the middle of the area, a difficult chance as the ball was a little bit behind him. Terrible start from Celtic, lovely start for OGS as Molde double their lead. A set-piece is not dealt with and Vegard Forren thumps a shot into the pitch, the bounce takes it in. Follow that game extensively here. Jurgen Klopp was a whirlwind of arm movements on the sidelines as his players converged in the centre for the restart. Go again, or words to that effect. Maybe not straight from the Steven Gerrard textbook actually. The Anfield crowd are soon back to full volume as they cheer their men on. That Kazan goal came against the run of play. "All too easy for Molde. They sucked Celtic and hit them with deadly precision on the break. Craig Gordon beaten at his near post but the back four was sliced open and that left him exposed." But that was not in the script! Jurgen Klopp sees his side concede for the first time as Nathaniel Clyne is caught out of position. What a goal though, as Marko Devic takes a ball over Clyne's head on his chest and then pokes a half-volley back across and into the net. Brilliantly done, Anfield in utter silence. An excellent finish! Celtic had started well but Molde crown a neat counter with a clinical finish as Ola Kamara beats Craig Gordon at his near post. Nathaniel Clyne races forward from halfway before cutting inside and shooting from the edge of the area. It is weak and wide, though. Emre Can draws out some applause from his manager as he spots a gap between two defenders and has a go at goal from outside the area. His curling effort is not far off, whizzing just beyond the upright and nestling into the side netting. Jurgen Klopp looks to have splashed out on a new coat to mark the occasion. He is sporting a smart grey duffle coat to combat the cold Liverpool night. The new manager's influence on show already? There has been some nice, one-touch passing from Liverpool, and they win a corner when James Milner's cross is blocked, but it comes to nothing. "Immediate correction to make as the game gets under way. Far from being a slick surface, the ball is holding up because the artificial pitch has become waterlogged. Celtic passing up an early chance for Leigh Griffiths." The Russian of course spent nearly three years at Everton at a cost of around £9m. He's on the bench tonight, a good spot by BBC Sport's chief football writer. Rubin Kazan want to spoil the party at Anfield and they quickly get at the Liverpool defence, Marko Devic driving forward. He takes a tumble just outside the area and wants a foul, referee is having none of it though. And we are under way in Molde as well. You can follow the action from that game on our Molde v Celtic live text. Molde XI: Horvath, Linnes, Toivio, Forren, Rindaroy, Daniel Hestad, Singh, Hussain, Mostrom, Kamara, Elyounoussi. Subs: Neydson, Semb Berge, Flo, Eirik Hestad, Hoiland, Bakenga, Sander Svendsen. Celtic XI: Gordon, Lustig, Ambrose, Boyata, Izaguirre, Brown, Bitton, Commons, Johansen, Armstrong, Griffiths. Subs: Bailly, Blackett, Ciftci, Mackay-Steven, Rogic, McGregor, Tierney. A huge roar from the stands just before the referee blows his whistle as Jurgen Klopp's first game at Anfield gets under way. Liverpool XI: Mignolet; Clyne, Skrtel, Sakho, Moreno; Can, Allen, Milner; Lallana, Coutinho, Origi. Subs: Bogdan, Toure, Benteke, Firmino, Lucas, Ibe, Randall. Rubin Kazan XI: Ryzhikov, Kuzmin, Kverkvelia, Kambolov, Nabiullin, Carlos Eduardo, Ozdoev, Gokdeniz Karadeniz, Georgiev, Devic, Kanunnikov. Subs: Haghighi, Lemos, Cotugno, Akhmetov, Bilyaletdinov, Portnyagin, Dyadyun. Applause as Jurgen Klopp walks out to take his place in the Liverpool dugout. The players line up for the Europa League anthem but it is hardly audible above the Liverpool chants. It may not be the biggest game in town in terms of the competition and the opponent but it is being treated like one by the Liverpool fans. It is absolutely packed at Anfield, with fans holding up scarves with "Klopp King of the Kop" written on them as the iconic You'll Never Walk Alone is belted out. Even the Liverpool owners are there. Big. "Kick-off is almost upon us and at the risk of being repetitive, the rain here is unrelenting. Nonetheless, the Celtic fans are in good voice as their team go through their final preparations. Ronny Deila has stressed that this match carries no more importance than any other despite him being back on home turf for the first time as Celtic manager. But he is no less desperate to win, especially having twice given up leads against Ajax and Fenerbahce." You can follow all the action from that game in our live text of Molde v Celtic. Brendan Rodgers started with a win at Anfield. Will Jurgen Klopp do likewise?Image caption: Brendan Rodgers started with a win at Anfield. 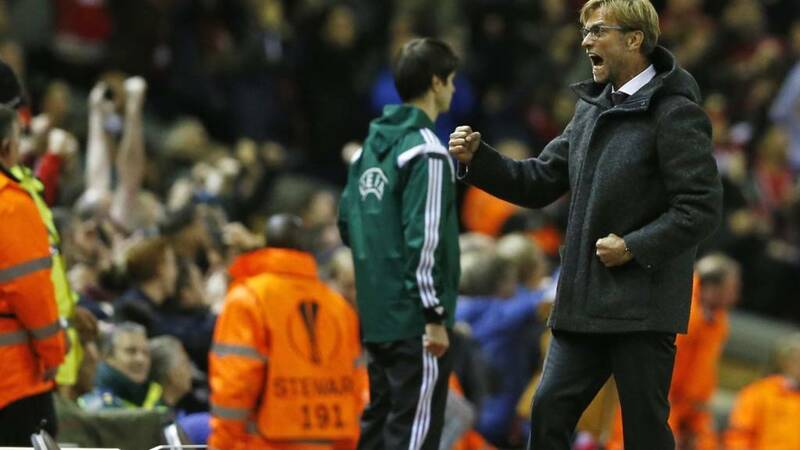 Will Jurgen Klopp do likewise? It is almost time for Anfield to welcome in the Jurgen Klopp era, with Liverpool facing Rubin Kazan in just under 10 minutes. There's plenty of buzz around the ground at the moment, can Klopp capitalise on that with a win? It all started so well for his predecessor as Brendan Rodgers' first match at Anfield ended with victory, the Reds beating Belarusian outfit Gomel 3-0 in the Europa League August 2012. How does that leave the group? Monaco have Lacina Traore to thank for their 1-0 win over Qarabag, a result which sees them top the group. Spurs and Anderlecht are left on four points, one behind the leaders. Stefano Okaka is off his seat in the bench! A big win for Anderlecht! Former Premier League striker Bradley Allen on BBC Radio London: "Spurs are committing midfield players, the full-backs are high and advanced. They have to move the ball that bit quicker as when it slows down, Anderlecht clog it up." Into the final five. Spurs haven't threatened since that big chance for Harry Kane and their opening 10-minute blitz is fading into the memory already. Albanian giants Skenderbeu are now 5-0 down at Sporting Lisbon and there's a shock brewing in Italy. Serie A leaders Fiorentina are 1-0 down at home to Lech Poznan. That result will leave them bottom of their group. Spurs and Anderlecht will be level on four points from three games if the score remains as it is, and Monaco will lead the group. A long way to go. Spurs have 10 minutes to fish out a draw. They plonk for 18-year-old Josh Onomah to replace Andros Townsend. Can the youngster do it? Spurs need to talk to Frank. Substitute Frank Acheampong slices Spurs open again and wins a corner. From the corner, Leander 'Clive' Dendoncker heads over when he really should have scored! Big chance for three. Former Premier League striker Bradley Allen on BBC Radio London: "He's got his boot in his hand, it's come off. He's in the right place at the right time. A super cross, he got in behind Kieran Trippier and the top scorer is not going to miss chances like that. "Spurs would take a point now from this position." You can listen to BBC Radio London at the top of this page. The big man is in the right place at the right time! Spurs are undone by a simple pass inside Kieran Trippier, substitute Frank Acheampong puts over a lovely cross from the left and Stefano Okaka arrives to fire into the net. All with only one boot on! BBC Radio Merseyside's James Mountford has been out and about snapping excited Liverpool fans. Many are congregating behind the Kop with just over 30 minutes to kick off. Is this competition a priority? Suddenly a run of the mill home game in Europe's second competition takes on huge significance because a new man stands in the dugout. Into the final 20 minutes. In Klopp-speak, if the first half was full throttle, this is now petrol conservation stuff. Drifting to the services. You're in Harry Kane! What a pass down the line to free Kane, he's onside, the angle is against him but he can get a shot away - saved by Silvio Proto. Guillaume Gillet does superbly again, a big tackle to stop Christian Eriksen from getting a shot off on goal. Belgian Mousa Dembele is then given a huge ovation by the home fans as he comes off for Spurs - on comes Dele Alli. Liverpool post on Instagram: Jurgen Klopp and Zeljko Buvac survey their new home ahead of tonight's clash with Rubin Kazan. Mamadou Sakho was at the heart of Liverpool's defence for Jurgen Klopp's first fixture - helping the Reds to a goalless draw at Tottenham. The French international was overlooked on occasion by Brendan Rodgers but believes he can be part of a successful side at Anfield. “I try to stay the same on and off the pitch," he tells Liverpool's website. "If you ask the players, they’ll say ‘Mama never changes’. “I am a very ambitious man but I prefer to keep them to myself because some people will think I’m crazy! But we’ll see. “I think we have a very good team, very good players, international players and we can have a very good season." Hugo Lloris has to be sharp to move away to his right and get hold of a header from Serigne Mbodji, it was a save he was always going to make though. Harry Kane's first involvement is to be tripped by Youri Tielemans - who is booked. The 1-1 draw is popular around Europe as things stand. Anderlecht v Tottenham, APOEL Nicosia v Asteras Tripolis and Schalke v Sparta Prague are all tied at 1-1. Switzerland's Basel, typically decent in Europe, trail 2-1 at home to Belenenses. Harry Kane is on for the last half hour. He replaces the game, but not great, Clinton Njie. "The rain has been pretty incessant in Molde over the past 24 hours and it has begun to fall even more heavily as kick-off approaches here in Norway. One thing is for sure, the artificial surface will be slick as the Group A leaders seek to prevent Ronny Deila making a winning return to his homeland. "The man who denied Ole Gunnar Solskjaer and Molde three successive league titles when he led Stromsgodset to the championship brings Leigh Griffiths, Stefan Johansen and Mikael Lustig into his team tonight as Celtic look for their first win of the group stage." It's still end to end stuff as Youri Tielemans picks the ball up after Mousa Dembele gives it up. Tielemans plays the right pass for Imoh Ezekiel - but his shot is wide of the target. Just the one change for Jurgen Klopp in his first game at Anfield as Liverpool boss. In comes Joe Allen for Lucas. Striker Christian Benteke, who has not played since a 1-1 draw with Norwich on 20 September, is on the bench. On the bench for Rubin Kazan is a person familiar with Liverpool. Midfielder Diniyar Bilyaletdinov made over 70 appearances for Everton between 2009 and 2012. Liverpool XI: Mignolet; Clyne, Skrtel, Sakho, Moreno; Can, Allen, Milner; Lallana, Coutinho, Origi. Rubin Kazan XI: Ryzhikov, Kuzmin, Kverkvelia, Kambolov, Nabiullin, Carlos Eduardo, Ozdoev, Gokdeniz Karadeniz, Georgiev, Devic, Kanunnikov. Guillaume Gillet again! The Anderlecht right-back scored a fine goal in the first half and he thunders another shot into the body of Hugo Lloris from long-range. So Anfield hopes to welcome a legend in the making tonight and a former Liverpool great (maybe not) has netted for Sporting Lisbon - Alberto Aquilani. His spot kick, followed by a Freddy Montero penalty, gives them a 2-0 lead over Skenderbeu Korce. So the next question is, where is Skenderbeu Korce? I can tell you it's in Albania. Korce is a city home to around 75,000 people. Elsewhere, in Tottenham's group, Monaco and Qarabag are level while Lazio still lead Rosenborg. Another brilliant pass from Christian Eriksen, he slices open the Anderlecht defence with one ball but Clinton Njie's first touch is not good enough to kill the ball and a defender gets across. Eriksen is on another level, with all due respect. Back under way in Belgium. 'Madhouse on tour' eh. What a bunch of characters. BBC Radio 5 live takes a rugby and formula 1 focus tonight but throughout the evening, there will be live updates from Anfield. Between 19:00 BST and 19:30 they will discuss the day's sports news including word on potential Uefa punishment for Manchester City and news on Bastian Schweinsteiger potentially taking legal action against a toy manufacturer. Europa League group stage newcomers Midtjylland have enjoyed a cracking start in the competition, winning both their group games so far, but the Danish side have a tough test against Italians Napoli tonight. Napoli made it through to the knockout stage in all three of their previous Europa League appearances, and they are well on course to progress again after recording back-to-back group stage wins. The victor from this match will take control of the group. Elsewhere, Robin van Persie has two goals in his last two games for club and country, and he will be looking to fire Fenerbahce to their first Europa League win of the season when they host Dutch giants Ajax tonight. Fenerbache are bottom of Group A with one point from two games. Jurgen Klopp names a very strong team - he makes just one change to the side in fact as Joe Allen replaces Lucas. Christian Benteke is back on the bench. Jurgen Klopp takes charge of Liverpool later tonight looking to kick-start their shaky Europa League campaign so far. No such problems for his former side Borussia Dortmund, though, as Pierre-Emerick Aubameyang hit a hat-trick to give them a 3-1 win at Azerbaijan side Qabala. The result strengthened Dortmund's grip on Group C, as they top the standings with seven points. Celtic are in action later this evening and there will be a familiar face in the opposition dugout. Molde will go into the game with a new head coach after Ole Gunnar Solskjaer returned to the Norwegian champions. He takes over from caretaker Erling Moe, who led them to a win and a draw against Fenerbahce and Ajax respectively after the sacking of Tor Ole Skullerud in August. That's the best 45 minutes of Europa League football I've seen in - well possibly ever. More of the same please! Spurs playing some really nice stuff as the half draws to a close. They always have a man over and this time they find the right pass, playing in Andros Townsend early, he moves on to his left foot but can only shoot wide. That was a very decent opening! In light of Manchester City being scrutinised by Uefa for their fans booing the Champions League anthem we want to know what the silliest thing you've been in trouble for is. Who needs 10 men when you've got Alessandro Matri? The striker has given Lazio the lead against Rosenborg despite the Italians having Mauricio sent off after three minutes. A win would put Lazio top of Group G on seven points. Elsewhere, Athletic Bilbao are one up at Partizan Belgrade - Raul Garcia - as they seek a second win from three group games. Clinton Njie has looked quick and direct up front for Spurs but he has struggled to get hold of the ball at times. He manages to do just that on an Anderlecht defender though after a tussle. Ouch! You can see why Stefano Okaka has got so many goals for Anderlecht, he's got all the tools in the box - big, strong and quick and after a neat touch he rattles in a low drive which Hugo Lloris hangs on to. The hosts now having a good spell as we tick towards half-time. Good game thus far. Erik Lamela isn't always on time and he's offside as he slams into the net. It came from a lovely slalom of a run from centre-back by Jan Vertonghen, he beat three men and fed it into the Argentine - but he had strayed beyond the last man. Still this game does the business. Very open. Bang! Right out of the middle of the bat, a smashing shot on the bounce from Stefano Okaka, hit like a bullet and Hugo Lloris will be feeling that one on his palms for at least seven minutes. Good save, wonderful hit! England's forgotten man Andros Townsend drives into the penalty area and is sent stumbling by a defender - he wants a spot-kick but referee Pol van Boekel is having none of it. It would have been soft. Eric Dier, who must be on the way to an England cap any day now, is involved three times in a lengthy passing move as Spurs look slick again. They are moving the ball neatly and quickly - ah until I type that and Toby Alderweireld pings one out of play. Twenty-five gone. The other game in this group is goalless in France between Monaco and Qarabag so it's as you were in the table. Chelsea and Wigan legend (well, kind of) Franco Di Santo has scored for Schalke and they lead Sparta Prague 1-0. It could be nine points from nine for the Germans in Group K.
Yes, the Europa League needs half the alphabet to name groups. Spurs need to get Christian Eriksen back on the ball. Since that opening 10 minutes he has drifted out of the game. Ben Davies is finding his own postcode on the left wing for Spurs time and time again - it can only be a matter of time until he picks someone out. This Spurs side have been very attractive to watch in the opening 18 minutes. BBC Radio London are commentating live from Anderlecht and former Premier League striker Bradley Allen is co-commentating: "It's lifted the home faithful, up on their feet in numbers now. They are surprised I think to be on level terms. Spurs didn't defend the corner, he takes it up onto his chest and volleys it into the corner. One attack, one corner, equalised and this game is turned on its head." If I'm being 100% transparent we weren't expecting a great deal from this game but so far it's been excellent. Open, end-to-end, loads of chances. A bona fide classic on the cards. Oh yes! What a finish from the full-back! It's Tim Sherwood's favourite Anderlecht player Guillaume Gillet with a cracker. The corner runs through to him on the edge of the box, his first touch pops the ball up in the air and he then cracks in a half-volley from 18 yards into the far corner! Imagine Matt Le Tissier in his pomp. Then dial it down by 35%. In light of Manchester City being in trouble for fans booing the Champions League anthem we are asking you what's the silliest thing you've been in trouble for. Clinton Njie makes his full debut for Tottenham tonight in place of Harry Kane. The Cameroon international is 22 and joined Spurs in the summer on a five-year deal from Lyon for a reported £10m. Kane's path from the youth set-up to first-team regular was a key factor in his move to north London. Now he gets his chance. And that should be two! Christian Eriksen looks far too good for this Anderlecht defence, they can't get anywhere near him as he picks up Eric Dier's pass and frees Erik Lamela into the area. Lamela in one-on-one, just needs the dink but he can only shoot tamely at Silvio Proto. Spurs utterly dominant in these opening minutes. The home crowd are still making a right old din though. A second Tottenham goal may quell their fire. Former Premier League striker Bradley Allen on BBC Radio London: "With his technical ability, he's not going to miss a chance like that. It ricocheted into his path fortunately, he missed moments ago but not that time, clinical finish." Listen to live commentary from BBC Radio London at the top of this page. Anderlecht do not learn their lesson! Minutes after he was clean through from a straight ball over the top, Christian Eriksen strokes Spurs ahead after more cowboy defending. Serigne Mbodji has all the time in the world to get the ball away but he smashed a hurried clearance into the face of a team-mate, the ball pings into Eriksen's path and he steers in left-footed from 12 yards out. Easy! What is the strangest thing you have been punished for? You can text us in to 81111 (UK Only) or tweet us at #bbcfootball. Anederlecht finished third in the Belgian league last season and currently occupy the exact same place this season after 11 matches. Their current squad is not littered with household names but right-back Anthony Vanden Borre may be remembered for a spell on loan at Portsmouth and midfielder Steven Defour was heavily linked with a move to the Premier League a few years ago. None of their squad were in the most recent Belgium squad - but that did only contain six players who play in Belgium. They do possess several youngsters who are very highly thought of - keep an eye on Dennis Praet and Youri Tielemans. Former Premier League striker Bradley Allen is co-commentator on BBC Radio London: "The manager has opted for a strong starting line up. He thinks seven points would put them in a healthy position and in the remaining two games he may be able to play some of the younger, impressive players coming through. They've got a busy fixture spell coming up with London derbies." You can listen to BBC Radio London's coverage at the top of this page. Hugo Lloris then lamps a huge clearance down the park and Spurs are in! The ball bobbles around, Christian Eriksen gets the ball on to his left foot and gets a shot away but it's straight at Silvio Porto. End-to-end stuff! Game on! Straight from kick-off Hugo Lloris flaps at a cross from Imoh Ezekiel. Rather unconvincing.